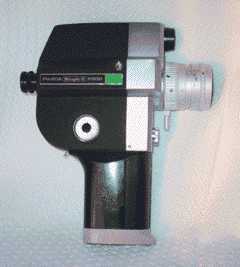 Produced inl 1967, this movie camera is equipped with a lens Fujinon Zoom 10,5-27,5 mm f:1.8. This model has two special accessory polarizers: one that is screwed ot to the front of the lens and one that goes over the exposure meter eze. With this camera, fade-ins, fade-outs and lap dossolves are possible with a lot of fumbling. In june 1972 this camera was replaced by the "P 300 New" which from the outside can be distinguished from its predecessor by its black plastic exposure meter eye (instead of silver) and a modified battery compartment lock on the grip. The weight of this camera is kg. 0,670 and its size is 52x185x154 mm.